If you set a limit, the outer circle of the cellular Connection Bubble displays how much of the limit has been consumed. If you'd like to adjust or disable these settings at any time, tap on the Connection Bubble at the top of the Dashboard. Then, toggle the daily or monthly limit options. You also have options when setting a limit: you can either throttle your connection to 200 Kbps or shut it off completely. When you reach 75% of the data limit you set, Speedify will warn you. When you hit the full data limit on a connection, Speedify will stay connected, but will stop using that network connection. You will be prompted to either let Speedify continue using the network connection or to stop using it. Of course, if that's your only internet connection, disabling it will take your device offline. However, this may be better than using more data than you have on your contract. Note: Speedify only tracks data usage from when you are actually connected to the Speedify VPN. 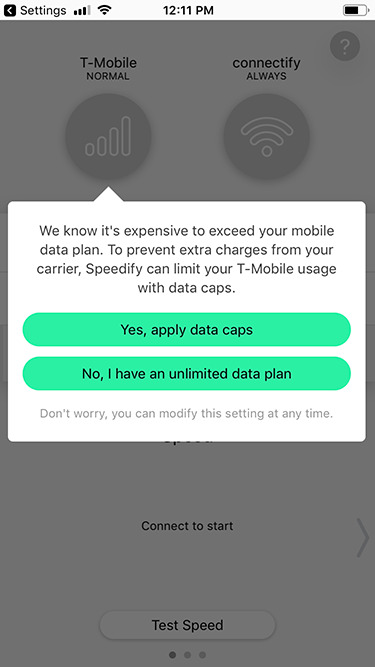 If you don't always use Speedify, you should set usage numbers that are lower than your actual monthly cap.